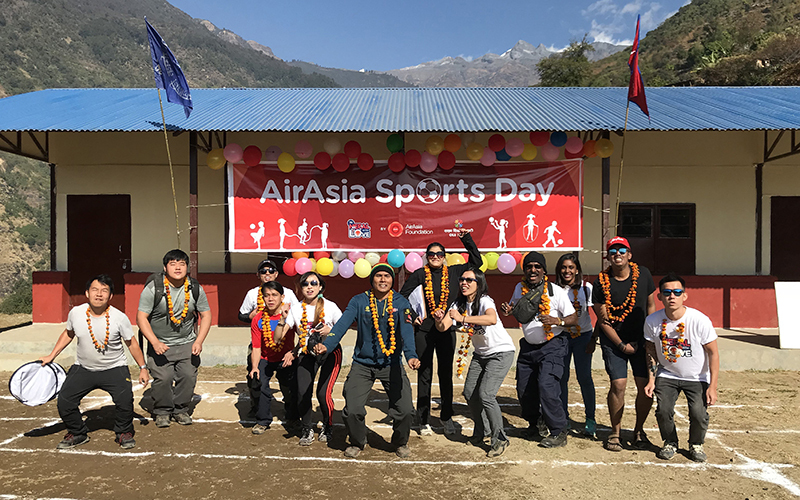 For my last work trip of 2017, I had the rather unusual task of leading a group of 9 Allstars (AirAsia staff) from 5 countries and a 5-member film crew up the Gorkha mountains of Nepal to a village called Olang. 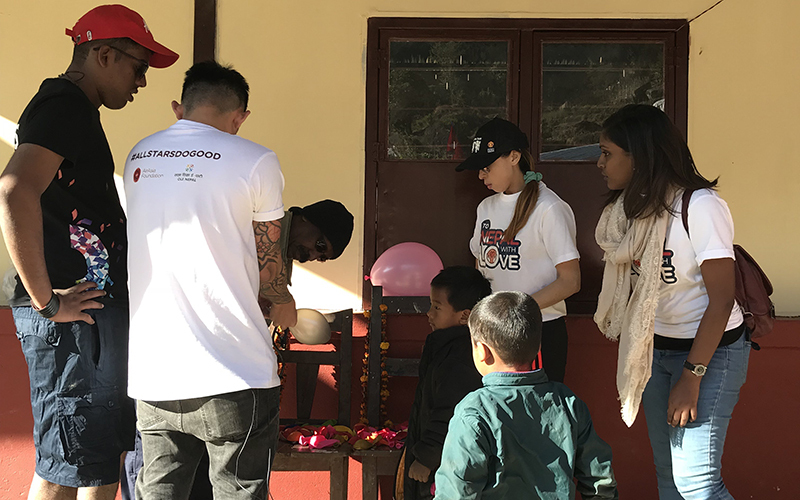 The trip was part of a two-and-a-half-year long ‘To Nepal with Love’ campaign that AirAsia Foundation has been running with an excellent organisation called Open Learning Exchange Nepal (OLE Nepal) since the 2015 earthquakes. We had raised over RM800,000 (just above USD200,000) which we pledged to OLE Nepal to rebuild 4 schools that served close to 300 students. After many hurdles, my counterpart in OLE Nepal, Rabi Karmacharya, called in November to say that the schools were finally ready (hooray!). We began to set in motion our plan to bring an Allstars team to organise a first Sports Day for the children to celebrate their new schools. Travelling up to Olang is not for the faint-hearted. I would describe the journey up to the village as the toughest ride I had ever made. It started the moment we arrived at Kathmandu’s Tribhuvan International Airport. We had to wrestle our way through the crowds to get our few hundred kilos worth of baggage. Other than our own gear, we were also bringing 300 schoolbags for the children and 4 sets of wonderful children’s books donated by BookXcess for new libraries. We spent our first night in a charming lodge in the town of Kurintar, before setting off the next morning in a small convoy. Over the next 6 hours, we would crawl our way up potholed paths, mountain streams and dust tracks, not much faster than 5km per hour. Sleep was not an option. With the extreme bumping and jolting, anyone dozing off risked getting a big bump on the head! Olang is the last village on the trail up the mountains. It is harsh, not only in terrain but also in climate. Villagers grow grain on terraces carved out of the rocky slopes. During the daytime, the sun would scorch but once it set, temperatures would dip to single digits. 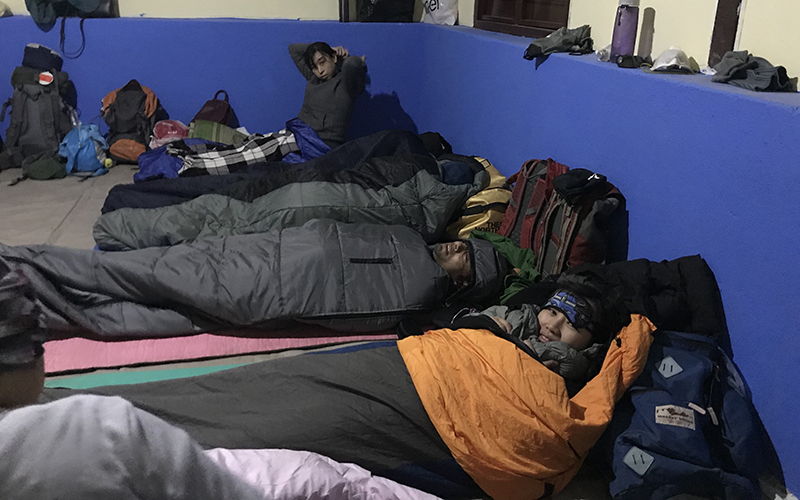 Thankfully, we didn’t have to camp - we slept on the floor of the new classrooms. All wrapped up like burritos. The cost to rebuild is high because materials have to be brought up the same rough roads. Thus, the drive into the schoolyard filled us with joy and a great sense of achievement. On our second morning, we awoke to the sound of excitement. Some children were already gathered in the schoolyard, curious about their visitors from lands far away. The Allstars soon got to work after washing up in icy mountain waters. A team began pumping balloons while another drew chalk lines on the ground. After a few formalities (speeches and plaques handover), the AirAsia Sports Day was underway! At the Allstars balloon stand. We started with a tug-of-war, followed by a gunny sack race, passing of rubberbands with straws, gorilla walk (children had to clamp a ball each under their armpits and between their knees while racing across to their teammates). Not only did the little ones had fun, parents and teachers were also cackling away at the children’s antics. As for the Allstars, we were happily reliving our childhoods. Do you remember this from your school Sports Days? The AirAsia Sports Day was our way of reintroducing play into education. The children here have endured much hardship and trauma during the disasters. With OLE Nepal, we wanted to provide them not only with hardware but also software. Each school funded by our campaign joins OLE Nepal’s One-Laptop-per-Child programme and receives 25 cute green children’s laptops, a server with lots of open source materials, teachers’ training, books for a new library and equipment for sports. School should not just be a place to learn but also to have fun. 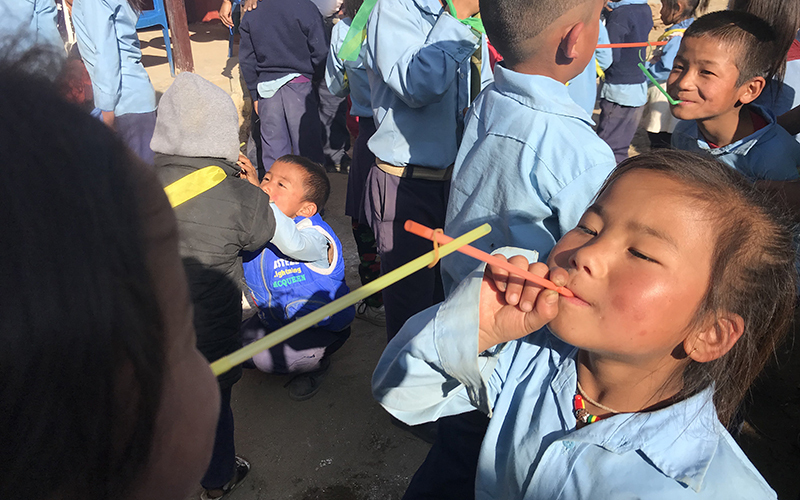 While doing this, we want to help students make a digital leap and connect with people and ideas outside their remote village. Two days later, we left Olang exhausted but exhilarated. We survived the even rougher ride back to Kathmandu, and thence back to our respective countries. What we bring with us are memories and hope that in our little way, we have been able to touch the children’s and the villagers’ lives, just as they have touched ours. Seeing the schools, we felt a great sense of achievement. Last but not least, we thank all guests, Allstars and friends who made it possible for us to make this gift to the beautiful children of Nepal. Glad they will no longer return to these old classrooms. Happy Holidays from all of us at AirAsia.